World Osteoporosis day was celebrated at Ganga Hospitals here on Friday. Senior citizens and students from different colleges participated in the event aimed at creating awareness about low bone mass or ‘Osteoporosis’. Doctors from different departments of Ganga hospital addressed the gathering and spoke in detail about the measures through which it could be avoided. 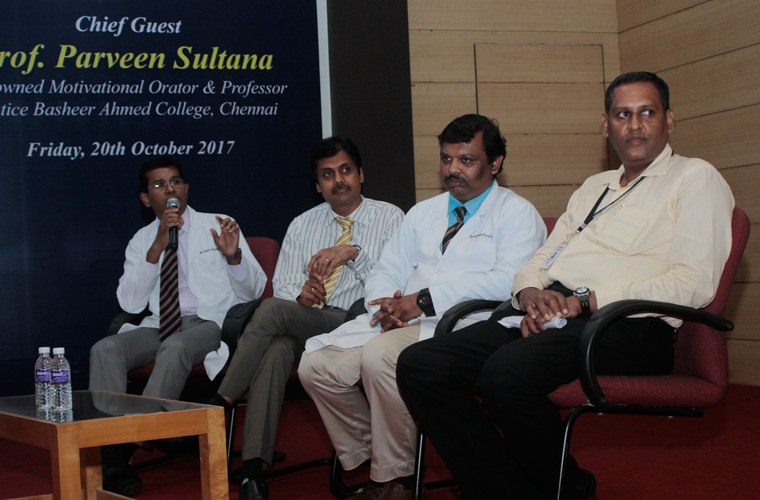 S Rajasekaran, Chairman of the Department of Orthopaedics, explained, ” Osteoporosis means porous bone. Healthy bone looks like a honey comb. When osteoporosis occurs, the holes and spaces in the honeycomb are much larger than in healthy bone. As bones become less dense, they weaken and are more likely to break.“ He said that 8.9 million fractures occur as a result of osteoporosis, and added that one in three women and one in five men over 50 years of age are at a risk of developing osteoporotic fracture. Dr. Rishi M Khanna said, “Like Blood Pressure and diabetes, osteoporosis does not show any symptoms.” He added that regular exercise and sporting activities and a diet containing calcium and vitamin D will help prevent osteoporosis. Renowned motivational speaker Prof. Parveen Sultana was the chief guest.